Changing from outside to inside clamping without taking the chuck off the machine? 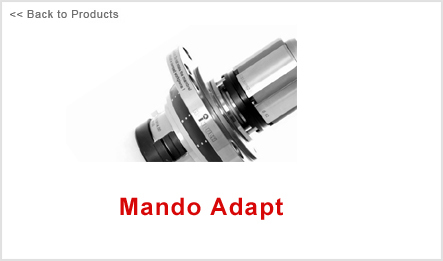 No problem with MANDO Adapt: Place the mandrel on the SPANNTOP chuck, tighten the three screws, screw in the draw bolt to actuate the segmented bushings - and an ingenious mechanism adapts to the coupling that normally grips the clamping head. That's all there is to it! You save a considerable amount of time and the MANDO Adapt delivers superb rigidity and precision as an added bonus. It results in a concentricity of less than 0.005 mm from the mandrel body to the chuck taper.